Two lawyers from Suisman Shapiro Attorneys at Law were selected by their peers for inclusion in the 25th Edition of The Best Lawyers in America® 2019. John A. Collins III was selected in the practice area of Personal Injury Litigation and Robert B. Keville in the area of Workers' Compensation Law. Since it was first published in 1983, Best Lawyers® has become universally regarded as the definitive guide to legal excellence. Best Lawyers lists are compiled based on an exhaustive peer-review evaluation. 83,000 industry leading lawyers are eligible to vote (from around the world), and we have received almost 10 million evaluations on the legal abilities of other lawyers based on their specific practice areas around the world. For the 2019 Edition of The Best Lawyers in America©, 7.4 million votes were analyzed, which resulted in more than 58,000 leading lawyers being included in the new edition. Lawyers are not required or allowed to pay a fee to be listed; therefore, inclusion in Best Lawyers is considered a singular honor. Corporate Counsel magazine has called Best Lawyers "the most respected referral list of attorneys in practice." John A. Collins III has successfully obtained verdicts or public settlements up to $10 million on behalf of injured victims over a 29-year law practice. He currently serves as the Managing Partner of Suisman Shapiro. The Connecticut Bar Foundation honored Attorney John A. Collins III in 2005 with his selection as a Life Fellow. "Selection as a Fellow requires demonstrated superior legal ability and devotion to the welfare of the community, state and nation, as well as to the advancement of the legal foundation". Source: Connecticut Bar Foundation. Attorney Robert B. Keville is a Director who concentrates in Worker's Compensation and Civil Litigation. Mr. Keville is a member of the Connecticut Bar, both State and Federal. He is also a member of the Connecticut Trial Lawyers Association.Mr. Keville’s practice focuses on the representation of injured workers in State and Federal Worker's Compensation forums, as well as serious personal injury claims. He has tried numerous cases to conclusion and has appeared before various Appellate tribunals, up thru and including the State of Connecticut Supreme Court. The law firm of Suisman Shapiro Attorneys-at-Law has been recognized by U.S. News & World Report’s Best Law Firms list for multiple years. 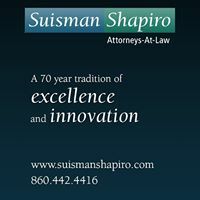 Suisman Shapiro is the largest law firm in eastern Connecticut, providing residents and businesses from New Haven to Providence with a full range of legal services.